@trillion: Hi Grover, do you believe the tea party is the legacy of the Taxpayer Protection Pledge? What role does the pledge play on Capitol Hill today? The taxpayer protection pledge is a written commitment by more than 90% of Republicans in the House and Senate to Oppose and vote against any net tax hike. The Tea party was a grassroots movement reacting negatively to overspending in early 2009—TARP one and two, Stimulus, and threats of more. The Tea Party gave us the GOP majority in 2010 focused on spending. The anti-spending message of the Tea party is a necessary complement to the Taxpayer Protection Pledge. @lotsasoftballqs: You have spoken out recently on why congress should make CRS reports generally available to the public. Could you expand on that? CRS reports are paid for with taxpayer dollars. All federal funded research should be open to the public for examination. Often "scientific" research is used to drive policy debate in politics .. Those "studies" should be open for all to read and critique. @f.sjl: How can we possibly even talk about deficit reduction if we rule out revenue increases before we even sit down at the table? Cutting spending alone will not do it unless you include major entitlement reform as part of it. The left have long argued that deficit reduction or a "grand bargain" must include both tax hikes and spending reform. We fell for this in 1982 and in 1990 -- taxes were raised. Spending went up. In 2011, the GOP refused to raise taxes and we won the sequester and spending fell from 24% to 20%. Politicians only limit spending or reform spending when taxes are off the table. Raising taxes is what politicians do to avoid reforming government. Paul Ryan has showed that we can reform entitlements to reduce the deficit, pay off the debt and limit spending. Congress has voted several times for his long term reform and no one has lost an election over it. Entitlement reform is not the third rail... It's what must be done. @wholistic.thinker: I've heard it said "Taxes are the price we pay to live in a civilized society." What are your thoughts on this? Some graduate of public education said "Taxes are the price we pay to live in a civilized society." Really. Every thug, King, dictator, tribal gang has had taxes. Not all have had civilization. Limited government makes civilization possible. Unlimited government makes Stalin, Mao & Detroit possible. The positive things governments can do are to: Protect property rights, freedom of contact, and freedom of association. @schocktreatment: Mr. Norquist- do you plan on taking this message to Burning Man this year? Do you think the demographics there will be receptive to it? (Also, what do you wear at Burning Man)? At Burning Man I wear desert clothes. It is hot during the day and cold at night. Long pants, boots, sweat absorbing shirt and pants. What I used to wear in Africa. Some folks wear less... But they need sunblock. The great thing about Burning Man is it proves that large number of people with very different views and ideas and backgrounds. Can function well together as long as there are few enough rules. The more complex a society the fewer rules are needed to acceptable. If everyone is the same, they won't mind -- but also don't need -- lots of rules. Burning Man is a Hayekian example of spontaneous order. It is many people working together & individuals creating a society where human freedom & innovation & art flourish. No one tells you what to do. They have roads laid out and a few rules on driving speed. After that you are on your own to make your own experience. That is why everyone is happy. They are not living someone else's idea of a great vacation or week. @cameronpig: Is it true you dressed up as Darth Vader at a RSI event? Yes. I wore the Darth Vader mask and outfit at the beginning of a debate on the politics of Star Wars. It was hosted by R Street and moderated by Benny Johnson of IJR. Great fun. I pointed out that the war began with a rebellion against high tariffs -- taxes. Central to all human history. @grover.norquist: You didn't ask, but my favorite color is red. @f.sjl: Why should the CRS be subject to public pressure when it comes to the information they provide members. Taxpayer dollars also pays for the Military and their documents are not public across the board. Most Pentagon studies should be available to the public. The goal should be to say -- make it public -- unless there is a strong reason to keep it secret... Like annexing Canada this weekend. @wadleigh.durkin: Grover, whats the best way to grow the size of the pie -as Jack Kemp used to say-without taxing us into oblivion and without creating huge deficits? The best way to create economic growth is to reduce the cost of government. 1) Lower the marginal tax rates 2) Have fewer and less expensive regulations. 3) Take all the trial lawyers and put them in a large plastic bag .. That is a list of the things government should stop doing or do less of. @sam.ward: Welcome to Cloakroom. I recognize that Hillary has lost the vaping vote and the support of Duncan Hunter, but do you have any support that these are swing voters that are in play? Hillary will lose at least one state because the many state democrats and Obama's FDA want to ban most vamping products & vaping itself. Today there are 9-10M vapers; they vote, they care, they know what Hillary's friends are up to. This will swing votes in a way Hillary and her aging advisors are incapable of understanding. @fogg.mcmahon: Is there another country 's tax system you like for the US? I like the flat tax of Hong Kong and Singapore and Massachusetts. Flat taxes are harder to increase than progressive taxes or graduated taxes because the politicians have to face the entire electorate whenever they want more money. @schocktreatment: Do you believe we can balance our budgets without breaking your tax increase pledge? How? Do you consider removing the payroll tax cap a tax increase? We can only balance the budget by first committing to no tax hikes. Any openness on the tax side means the politicians will never, ever reduce spending. If the Dems wanted to raise taxes & cut spending they could have done so in 2009 or 2010. But for 700 days they didn't. At SOME point if someone says they want to go to the gym, but they don't do it for two years straight... I think they fib. @realfrankgaffney: Would you take Obama to next year's burning man? If not what dem would you take? I expect to be joined at Burning Man with between one and three GOP congressmen. They all say they will come. This time one has pinky promised to be there and the other two say they plan to. I met Dennis Kucinich at Burning Man a few years ago, but he was then a former Member. Not sure if any sitting Member has been before. @f.sjl: You assume every person in the groups you have mentioned are single issue voters on the issue that affects that group. It is a poor assumption. Not all taxpayers vote on taxes. Not all vapers vote on vaping. Not all gun owners vote on gun issues. But many do... Single issue voters first have to agree on the issue... Then it has to be central to who they are. People vote on LIFESTYLE ISSUES. Homeschoolers are homeschoolers. It is how they self-identify. The D party wants to band their central essence. They know this. Vapers know that Ds are prohibitionists. It creates more single issue voters. Some taxpayers vote on taxes... Some vote on other issues. You have to ask people which their key issue is. The key takeaway from this election is to remind the GOP House & Senate that the GOP & conservative movement must learn to govern from Congress. Dems did for 60 years.The GOP should stop deferring to the president. Nixon, Ike, Reagon, Bush, Bush Bush. Presidents are for signing good legislation. Kemp/Roth was Reagan's legacy and Congress's idea. 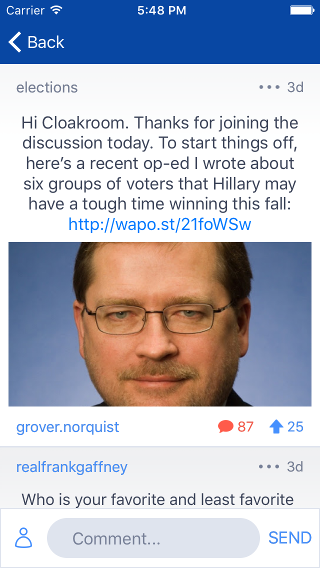 @grover.norquist: Closing thoughts: Government creates wealth the way ticks create blood. VAT is a French word meaning "Big Government.” Keynesianism is the idea that you can take water from one side of the lake, walk around the lake to the other side, pour your bucket of lake water back into the lake, thus you are stimulating the lake to the great depths. This election will swing on the Sharing Economy and the Democrat party's core constituencies that hate it. 400k UBER drivers and millions of UBER consumers will vote to defeat the party of Taxi commissions. Hillary Clinton wants you to have a job... Not an independent career or be an independent contractor. And she wants you to have a boss... So you can be forced to join a union and you are easier to tax.